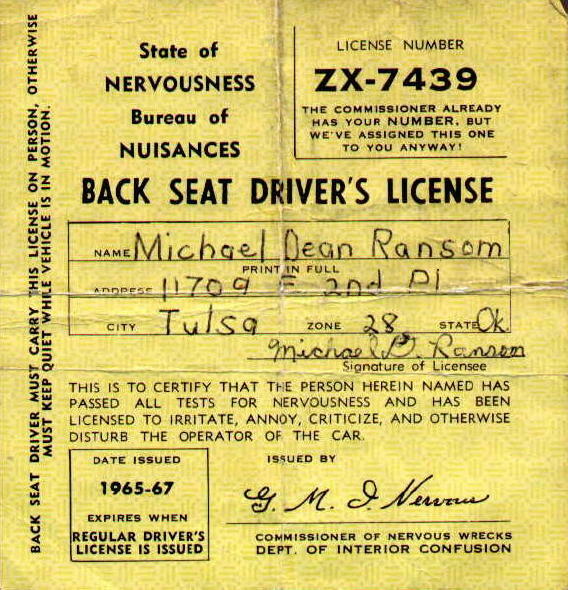 Related on this site: Tulsa 1957. The Tulsa stretch of Route 66 became 11th Street (though there was an Admiral Place alignment of 66 during the years 1926-1932). The Hi-Way 66 Drive-In opened in 1947. 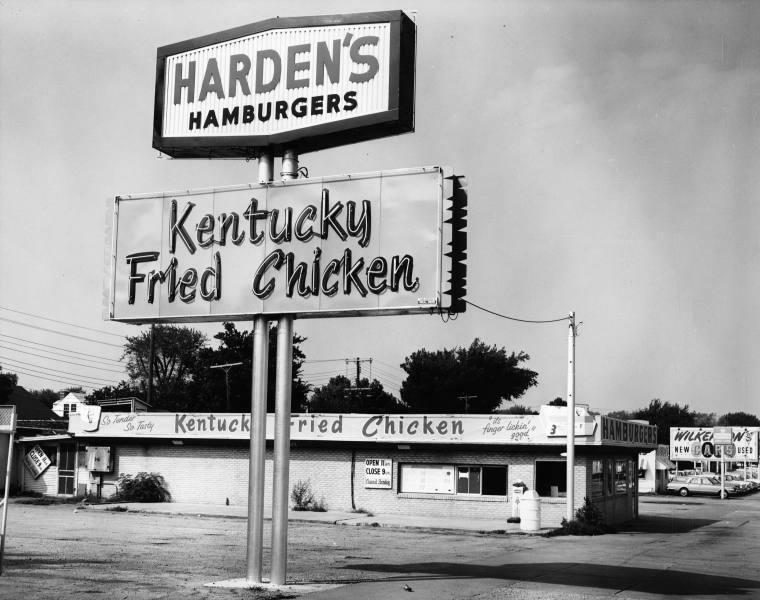 It was rebuilt as 11th Street Drive-In Theatre in 1964. 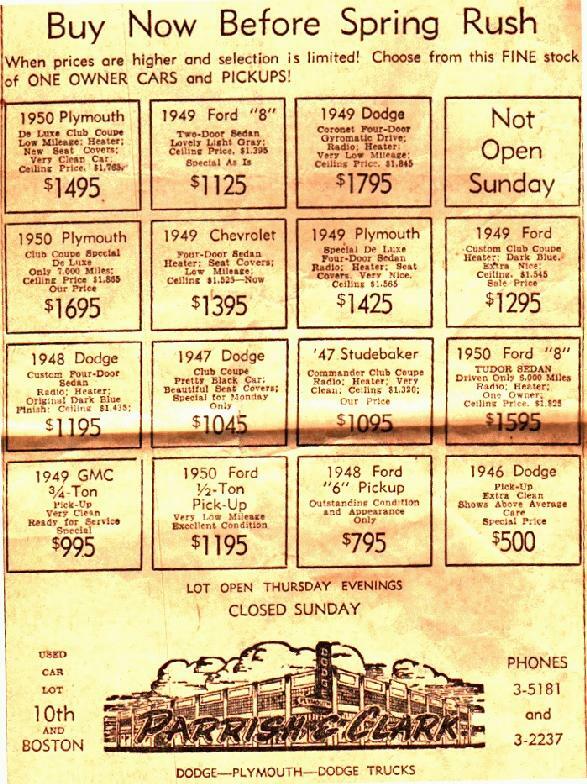 11th Street was car lot heaven as far back as I can remember (to the 1950s). "My Daddy say buy new car." This was blurted with no feeling or interpretation. He might as well have grunted. Terre Nelson via GB, 7/23/18: "Bill Newport was my uncle. Billy was a lovely boy. He was mentally challenged. Could this be the one Jim is talking about? 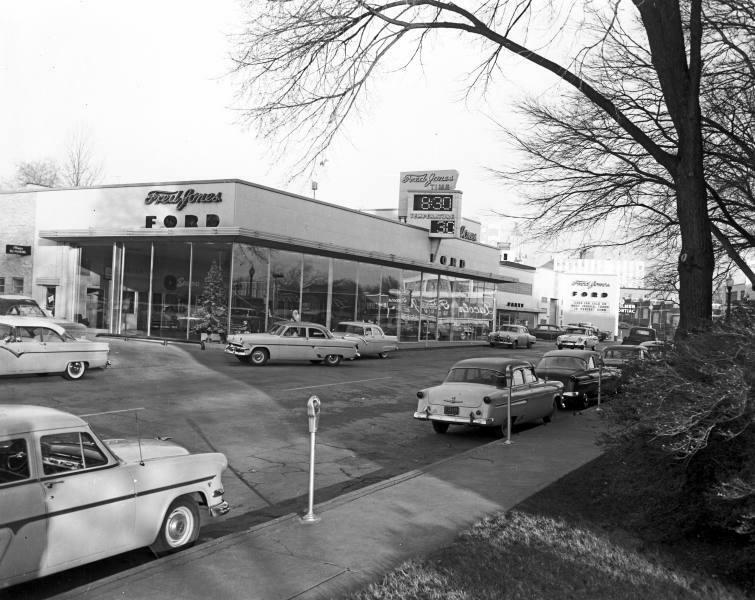 In 1961, the Kon-Tiki Koni was just to the west at 4418 E. Admiral Pl. "I had 'em so bad I could barely walk." He didn't explain what "they" were, but I guess you were supposed to figure it out. But because "RP" was never defined on the air, the hemorrhoidal reference was lost on most of the world. Not that most of the world was listening to KAKC. 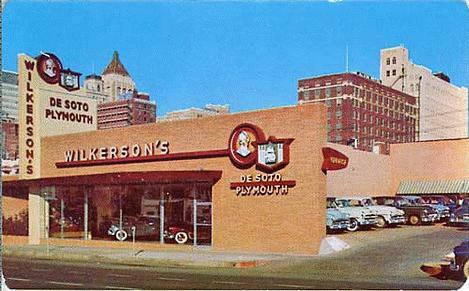 (Here is) a pic you can add to your "Tulsa Car Dealers" section. I bought a lot of car parts from them (Boston and 17th, If I remember) when I was building a '32 Ford hot rod back in the sixties. Still have the car and still have the memories. Another memorable car ad was the famous 'Chick don't care' where someone would take a baseball bat to one of Chick Norton's huge Buick Roadmasters. I found out later that he did most of his commercials this way and many times to good effect. Art Ford told me of one in particular where he stood on the curb at the corner of 3rd and Frankfort so he could get traffic sounds as he did the spot. His was a one man agency and I think he had most of his materials in his unkempt suit. I seem to recall he always wore a hat, summer or winter. I think Needham Tires had the head of an Indian Chief in full war bonnet as a logo. So, I suppose that accounts for the "Ugh!" that was the keynote word in all the spots? Oh yeah, U-Need-Um Tires. You probably remember the commercials always opened with the traditional sound of an Indian drum beat and then he would say, "Ugh! U-Need-Um Tires?" So one time we were surpised to hear the commercial start with his voice saying, "Tom tom tom tom. Tom tom tom tom." He then explained he had been running around town making commercials at so many radio stations that he left his drum behind somewhere. I never believed it. In the early '50s, Roy Pickett did Needham Tire commercials, complete with "ugh," on KTUL. So many great memories on this site. Does anyone remember "Jimmy Giant?" We grew up under his shadow on 11th Street (old Route 66). He's probably the reason I'm driving a pick up truck today. Here's the only pic of Jimmy Giant I could find. It's Crager GMC's giant billboard on 11th Street. This came from an early '70's phonebook. Always wondered who win the fight: Jimmy or the Driller. Favorite Tulsa TV Commercial: "Chick Don't Care" and they would take a baseball bat and bust the windshield out of a new Buick. 1956 or 57? Karl, that commercial must have been in the 60s, because I remember it. Someone on the ok.tulsa.general newsgroup mentioned this commercial as well. There's nothing like viewing property damage to make you want to purchase a product. I guess that's why there is a current commercial in which a washer is dropped off the top of a building. 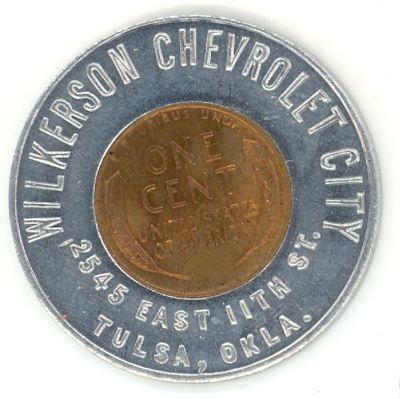 Ed Colton: "Here's the Wilkerson badge that I pried off of my 1967 Chevelle SS396 back in 1971. It came from Wilkerson's downtown dealership." I have a very faint memory of a TV ad for Wilkerson Chevrolet. Many years ago there was a large billboard with Mr. Wilkerson's portrait. In the TV spot, a family is driving by the billboard, and the portrait "winks" at them. Does any one else remember this ad, or is this perhaps an hallucination from drinking too much Cragmont Sparkling Punch? Just noticed that D.B. Wilkerson died Monday at age 88. 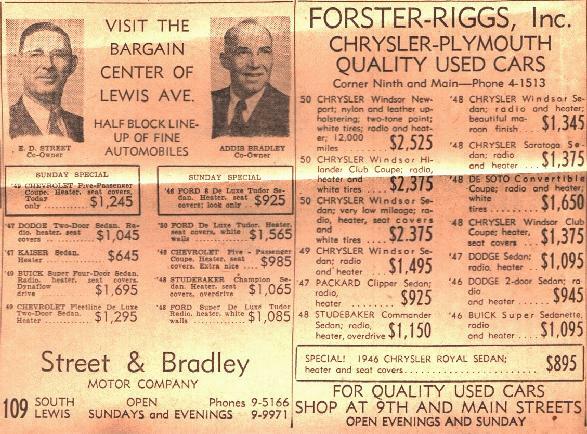 A noted (on these pages) Tulsa car dealer from the past. D.B. Wilkerson, the retired owner of Wilkerson Chevrolet Inc., died Monday. He was 88. Wilkerson was born on May 24, 1912, in Fort Smith, Ark. He graduated from high school in Fort Smith in 1930 and began his automotive career as an employee of Adams Motor Co. In 1932, he purchased a parking lot, where he operated a used car business until he received a Chevrolet franchise in 1954. Wilkerson was elected to the board of directors of Major Engineering Co. in 1966. 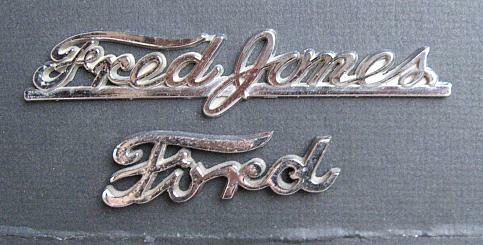 In 1972, he received a Quality Dealer Award from Time magazine. Wilkerson played a major role in the development of Oral Roberts University and received an honorary doctorate in 1980 for his commitment to the American free enterprise system and for his support of ORU. He is survived by two daughters, Marilyn Olsson of Tulsa and Dianne Lewallen of Plano, Texas; one son, D.B. "Tink" Wilkerson Jr. of Tulsa; eight grandchildren; and 14 great- grandchildren. Well, that's sad to hear about Mr. Wilkerson passing on. 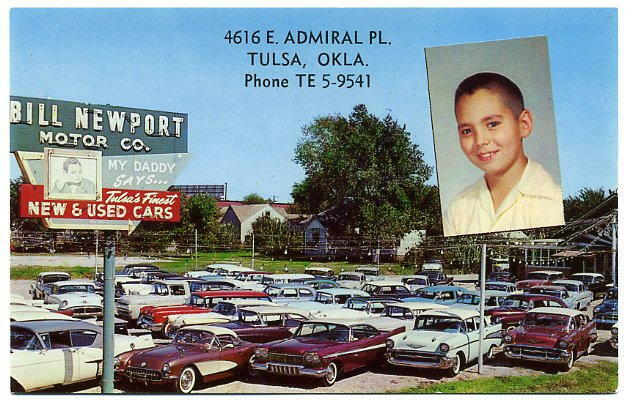 Tulsa definitely had its collection of memorable car dealers. I can remember a radio spot they ran for years with a little old lady that could never remember his name. "Why I got my new car from ....uh, what's his name?" Just read the notice of Mr. D.B. Wilkerson's passing in Feb. I worked for Wilkerson Chevrolet and Mr. D.B. during summer vacations and school holidays in 1965 and 66. It was my job to shuttle customers to their jobs or homes and then run parts during the rest of the day. Even though Wilkerson Chevrolet had a courtesy car driver on staff, he still saw to it that his customers were taken care of and didn't have to stand around waiting for the car to return. He'd put me in the customer's car with the customer and tell me to get them home and bring the car back. Since then, I've compared every car dealership I've gone into with Wilkerson Chev. and none of them come close to the way Mr. D.B. treated his customers. Service like that is hard to find - - maybe can't be found anymore. And every now and then, I'd get to drive a Corvette or Super Sport! Pretty good stuff for a 17 year old kid. He made a very lasting impression on me then and I've never forgotten how good he treated me. A true gentleman. The world is a little less bright. Does anyone remember the Bob Drewel Dodge ads from the seventies? They were located at 11th and Harvard. They sold Dodge Asperns (Aspens). That one always made me laugh. Good one, pretty obscure. I preferred to think of it as Bob "Drool" Dodge. The salesman...Charles R. Meadors, I believe, selling "Ahrspens". You may recognize the building that was across from TJC, now TCC. A semi(? 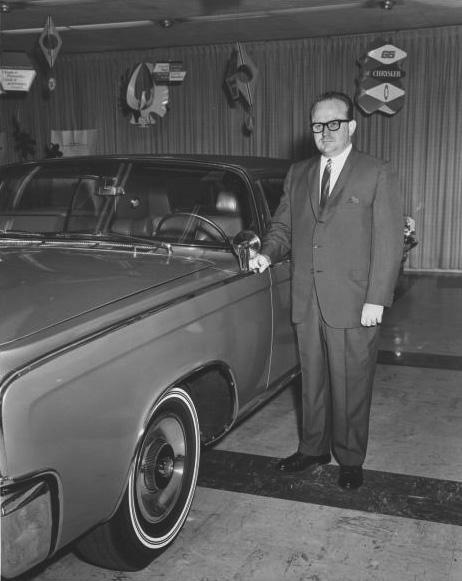 )-shyster car dealer came in to town by the name of Charlie Shepherd who opened a Kaiser-Frazier dealership. His mode of operation apparently was to hit a town running, and inundate it with a huge media blitz, particularly on radio. He'd peddle as many cars as he could, sell his business at a profit, then move on. His commercials contained loud sound effects and two screaming announcers talking so fast that you almost couldn't understand them. I was astonished to find out when I started at KTUL (AM radio in the 1950s) that Roy Pickett and Jack Morris were the two announcers. When I asked Roy about doing such rather debasing commercials, he simply shrugged his shoulders and said gently, "It pays the bills." I remember the the spots for National Motor Company where the little kid says; "My daddy gives the best car deals in the whooooole world!" Speaking of which, what did Bill Cox want to do...and to whom?" Was it, "I want to sell YOU a car!"...? The "Kon-Tiki Koni" was located at 4418 Admiral Place and first appeared in the 1961 phone book. The Kon-Tiki Koni tiki head appeared to be made of heavily lacquered papier-mâchè and was a garish orange-ish color. I remember it being at least 7' tall. Tom Lester told me that colored light bulbs served as the eyes, one red, one green, flashing alternately. A speaker in the mouth blared South Seas music, occasionally prompting someone from Rose Hill Cemetery across the street to ask for the volume to be reduced. Smoke from the meat smoker issued festively from the nose. All in all, it was a bizarre and spooky sight for a youngster to see at night from the windows of his parents' car. 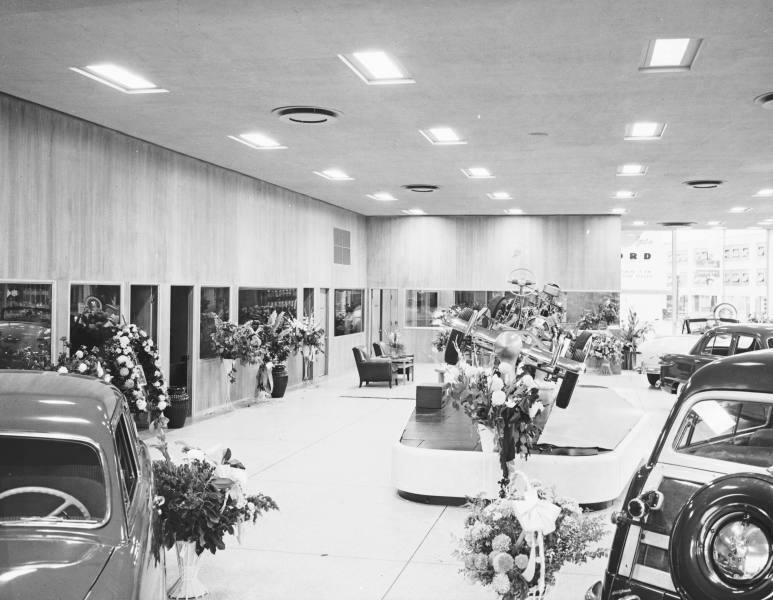 By 1968, it had become "Kon-Tiki Motors", a used car lot. Speaking of Tulsa car dealerships, here is a related item. 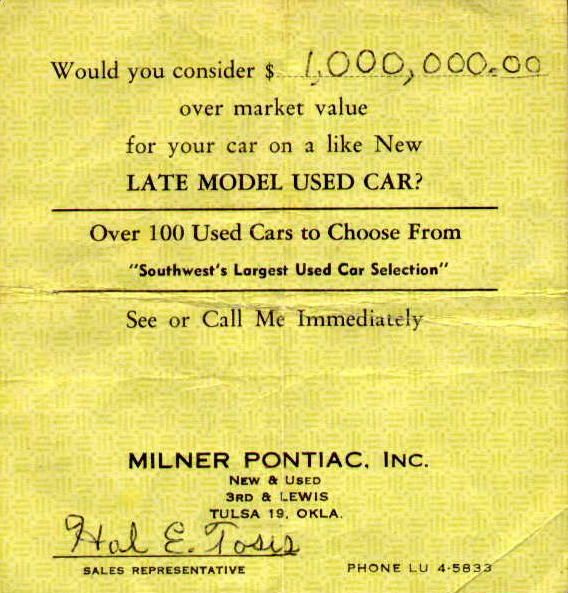 When I was 12, I thought it highly amusing to sign the Milner Pontiac sales rep as "Hal E. Tosis" (a character of George Carlin's in the 1960s). This gag item has been around for awhile. Do those of you who spent time in OKC remember Alan Merrell Chevrolet? "Due to da demands of da Mexican market, we need your used car..." or something like that. A recent article in the Tulsa World mentioned in passing that his son ran for office sometime back. Despite a large amount of money spent on the campaign, Alan Merrell, Jr. lost to a retired guy, who only spent about $150 on his campaign. It was surmised that the voters were really voting against Merrell, Sr., and his omnipresent, Daffy Duck-voiced ads, as the article put it. Actually, he sounded more like a jacked-up George Jessel. This was mentioned in relation to the current campaign of car dealer Andy Ewing ("IN Muskogee!"). Merrell's tag line was "Thank you for allowing me into your home or place of business". Mr. Ace Jackelope asked me by email if Tulsa ever had a Roto-Sphere. I know for sure that we did, but can't quite remember where it was. Could it have been at a car lot on 11th Street? If memory serves me (and it prolly don't...) a Chevy dealer on the edge of downtown had a big thingy like that. I think is was...White or Wilkerson??? I was just a kid so who knows what I was really seeing! Webmaster: I too was thinking possibly Bill White Chevrolet had a Roto-Sphere. Mike, you are right. Bill White had the rotosphere. Tulsan Michael Wallis, author of Route 66: The Mother Road, admirably voiced the "Sheriff" in Pixar's new hit movie, "Cars", mostly set on old Route 66.
, 2/20/2009: Route 66: The Television Series 1960-1964 - Episode guide by James Rosin. Read more at his web site: ClassicTVseriesBooks.com/route66.html.